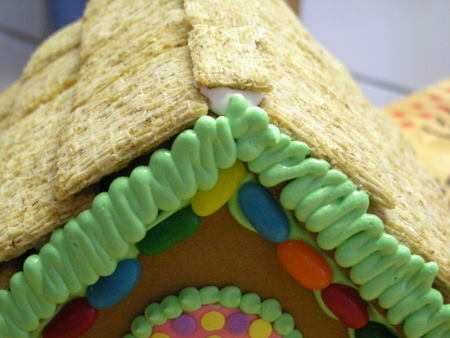 Who doesn’t love gingerbread houses? These miniature creations of flour and candy are one of my cherished memories from Christmas time. The cute little dollops, miniature candy accents, frosting snow and candy cane doorways make me want to squeal with delight. 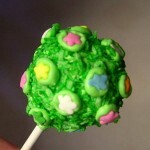 I’m tortured every year waiting until Christmas time to make them – but no longer! 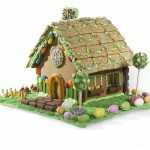 I came across a tutorial for making adorable Easter gingerbread houses on the King Arthur Flour blog. 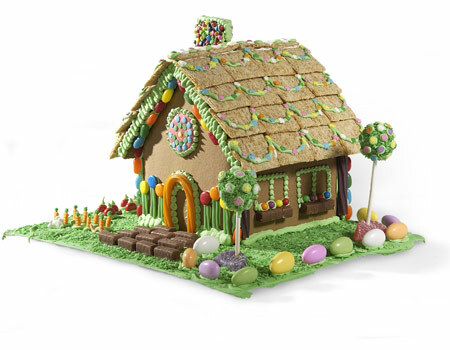 This cottage-style gingerbread house is surrounded by a Springtime garden of carrots and tomatoes. 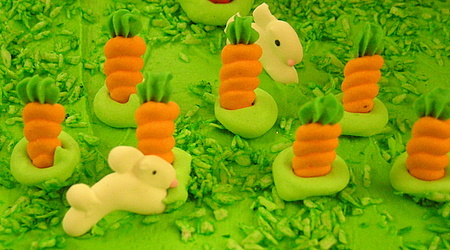 Rabbits frolic and Chinese noodle worms dance among the chocolate stones, dyed coconut greenery and Twizzler flowers. 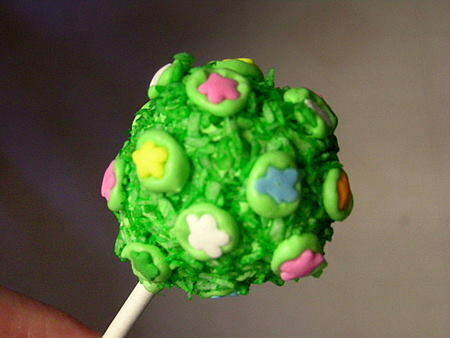 The lollipop trees rolled in frosting and coconut are a delightful touch. Simply adorable! 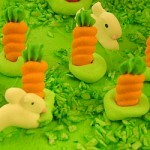 King Arthur Flour also has a post about creative decorations for Easter cookies to really make your holiday baking shine. Check out their blog for other food ideas if you’re feeling hungry. I just wanted to say, I enjoyed your blog post and I added your link to my WordPress blog today as a recommended site. This is the blog I was looking for! Thanks.